Well I guess this is my final blog post until next season. The blog will continue but my friend Adam will be writing with Hendrick House’s current news. Thank you so much for tuning in to our little project and I hope you will keep checking for updates to see what next season has in store. I have learned so much with the Beginning Farmer’s class and have made some really great friends in the industry. I can not thank them enough for their patience and guidance. I would personally like to thank Rick Weinzierl for taking on this fantastic program and being an amazing teacher and wonderful friend. He has offered so many opportunities to me and my company and I am forever grateful for this experience. I would like to thank Mary Hosier for her complete support for my company and my cooking. 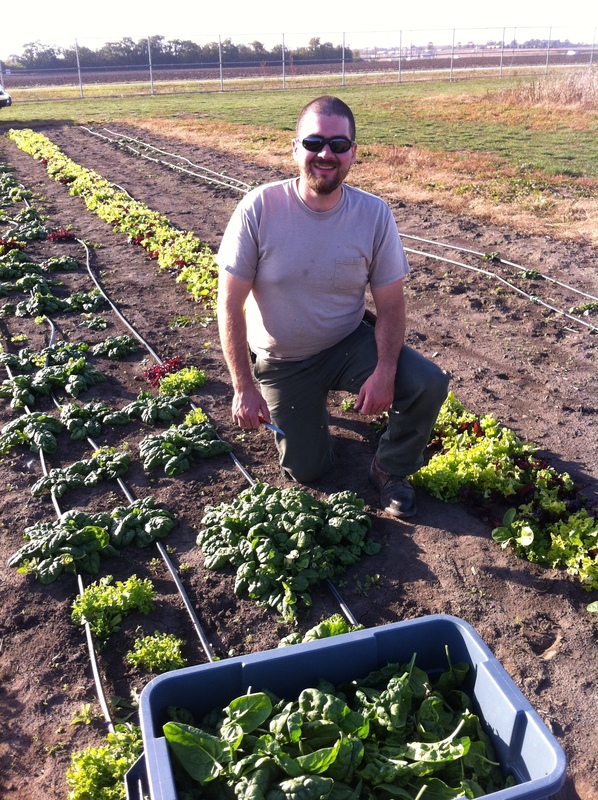 It was a huge compliment that you organized and attended farm to table dinners requesting me as your chef. I would also like to thank Jeremy Shafer and Bryan Warsaw for all of their help and guidance. These two people, along with Kenny Ehler, are some of the best people I have met in my time in Champaign. They are truly golden! Not only were they knowledgeable and willing to teach me, but they were also a lot of fun. I highly recommend getting to know these guys if you have the chance. Jeff Kindhart is a one of a kind! Absolutely hilarious, although he made fun of me A LOT :). That’s ok though…. he didn’t know what risotto was :). LOL. He is an amazing resource to have. He helped me immensely this year with my tomatoes and steaming my spinach bed to make it weed free. All of the people I have listed DONATED their time to help me, just because they wanted me to succeed. It was an amazing feeling getting to work with these people. Finally, thank you to the Student Sustainable Farm (Zack and Matt) for loaning out your equipment and teaching me to use it. Also, thank you for allowing me to tag along and help with your harvests. There is no better way to learn than hands on! 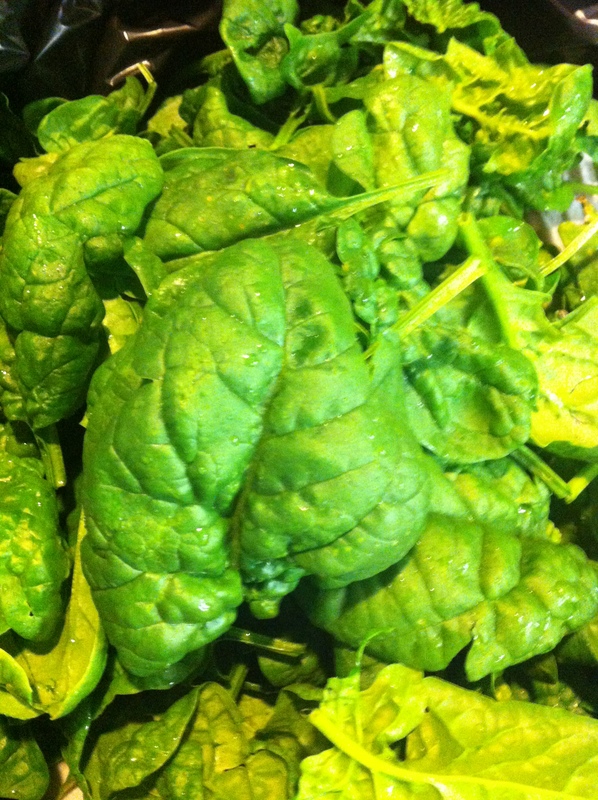 That being said, I had my final harvest of spinach today. It was an absolutely perfect day and I was happy to be outside for a couple hours. I even had a surprise visitor show up. My good friend Phil, who owns and farms Moraine View Farms, just happened to be driving by. I was happy to see him and even talked him into helping me harvest the rest of my spinach. The power of persuasion :). I love talking with Phil. 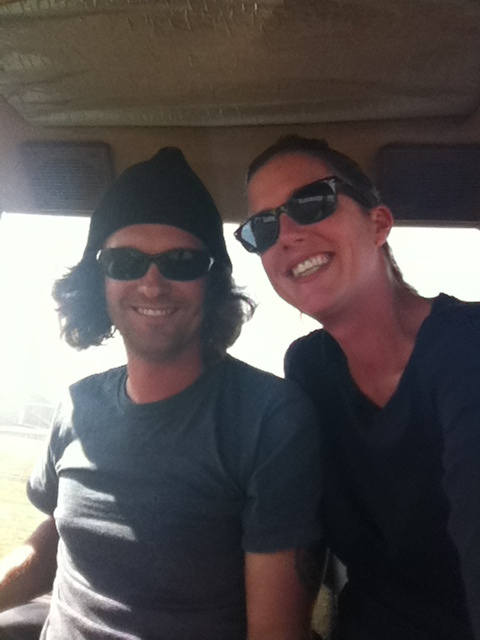 He is so easy going and has so much insight in to organic farming. He loves to share his knowledge with me and I am always interested to hear what he has going on during the seasons at his farm. I will miss the casual visits from Jeremy and Bryan, just checking to see how my day is. I will miss working 1.5 acres away from Todd, who was another incredible friend, helping me in anyway he could as we learned together through disease and insect trouble. I will also miss the visits from Rick, who was always eager to help. I learned so much from him this season. All and all this was such a valuable experience and I look forward to learning from all my mistakes as I plan for next year. After the excitement of planting my own cover crop last Monday I took the rest of the week off from our little farm project. I had a multiple course alumni dinner Friday night, so it was nice to focus on just that event. Now that the tomatoes, peppers and green beans are out I went by today to examine what I had left. 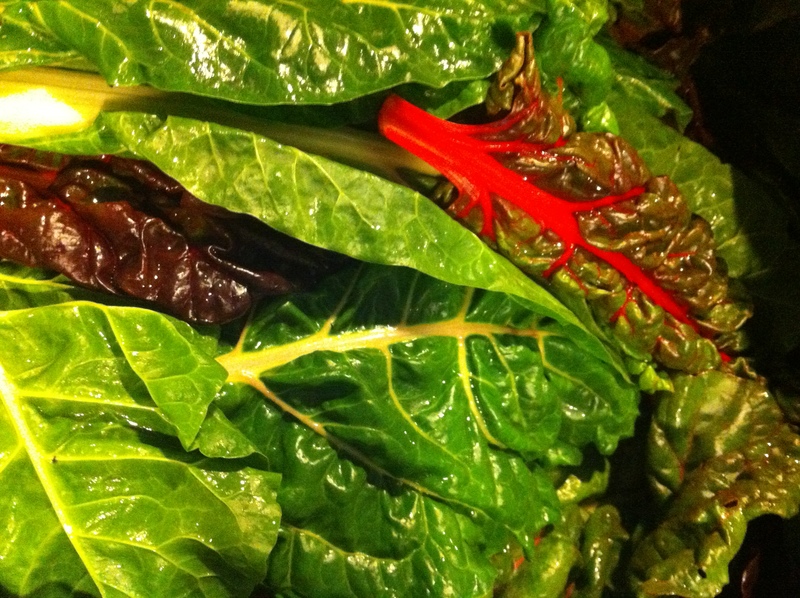 I ended up harvesting 33# of chard and 10# of spinach, both of which were absolutely beautiful. I’m not sure if you remember, but the spinach was planted by some sweet volunteers from the fraternity I cook for. They were so excited to see the final product walk through the door and couldn’t wait to taste it. By some miraculous turn of events, the kale has made a comeback. Maybe it took leaving it alone for a month?? Who knows?? Since we promoted it so heavily at the beginning of the school year I am very glad that we can get another harvest out of it before the season is finished. I had my second to last class of the Beginning Farmer’s Program this past Saturday. I am so sad to see it coming to an end. While we were in small groups discussing business plans and marketing, it came up how it is very hard to make money as a small vegetable farmer unless you find your perfect niche market and it is also incredibly labor intensive. One person in the discussion group even said, “and why are we doing this again??”. I sat there for a minute and thought to myself how fortunate I am to work for a company who provides me personal security while sharing the same dreams and interests. People do this for passion and the love of good food. I did laugh to myself thinking how I was an art major in college, switching to hospitality (because I didn’t think I could make a successful career out of it) and then ending up in culinary and farming, sitting in a class listening to a guest speaker say how hard it is to make this work. I love a challenge :). If you have driven down south Lincoln in the past week you may have caught a glimpse of some funny sights. 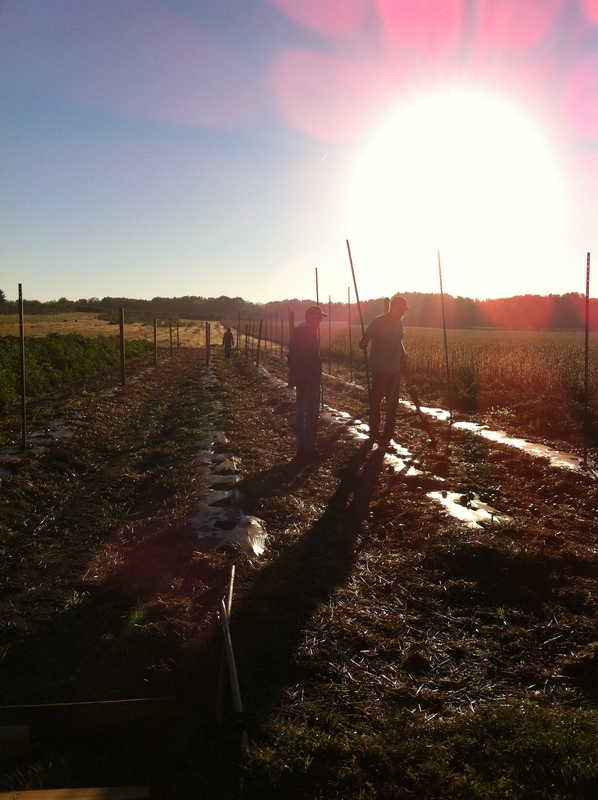 Last Tuesday I had three wonderful men volunteer their time to help me take down my heavy tomato trellising. I met Jeremy, Bryan and Kenny early that morning and they had the posts and 4×4’s out in less than an hour. The earth anchors however, were a much different story. I was reminded several times in the hour that followed that I really only needed 18″-36″ earth anchors. NOT 48″! Being the novice that I am, I did not know what a problem this would be until it came time to spin/pull/push/yank them out of the ground. Now these guys could have left after the posts and 4×4’s were out, but being the sweet farmers (with hearts of gold) that they are, they chose to finish the job and help me get those earth anchors out of the ground. It started with individuals spinning, then doubles spinning and finished with two fed up farm boys hooking the earth anchor by chain to the back of one of their pickup trucks. Come hell or high water THAT earth anchor was coming out of the ground. I don’t think I have laughed so hard in my life. Now that the trellising was down the next step was to do a final harvest on peppers and green beans (to clear out the remaining raised beds with plastic mulch). We harvested close to 100# of peppers and 40# of green beans. Like the tomatoes, it was bittersweet to see them come to an end, especially since they flourished despite all the bacterial leaf spot challenges. My boys absolutely loved the green beans so it was a nice way to say goodbye to that crop for the year. After all 530 plants (not counting green beans) were ripped out I then started to remove the plastic and drip tape. Jeremy taught me about the egg roll method, which was quite impressive, although back breaking. Unfortunately, with that method your face is very close to the ground and also close to any critter that might be waiting to surprise you. I managed to finish it all and also squeeze in a 40# harvest of salad greens by Thursday of last week. It felt good to to finally be finished and ready to till. Guess who got to plant her own cover crop using a drill seeding implement?? Yep, this girl! This was definitely a highlight of the end of my season. THEY FINALLY TAUGHT ME TO DRIVE THE TRACTOR! 🙂 It was just as awesome as you would think it would be. I chose a rye and clover cover crop to plant and once again my sweet friends Jeremy and Bryan made time to help by tilling and allowing the use of their drill seeder. Both varieties of seed will put nutrients back in to the soil (especially nitrogen) that will help in the growing season for next year. I was a little late getting the cover crop in, but am hopeful the weather will hold out so we can get enough growth before it gets too cold. Things are winding down for the season. As expected it is very sad to see the bare spot where the tomatoes used to be. I ripped out my tomato plants Saturday and am in the process of taking down the trellising, drip tape and plastic we put up in June. It now makes sense to me the importance of biodegradable ground cover experiments the U of I is doing on raised beds :-). 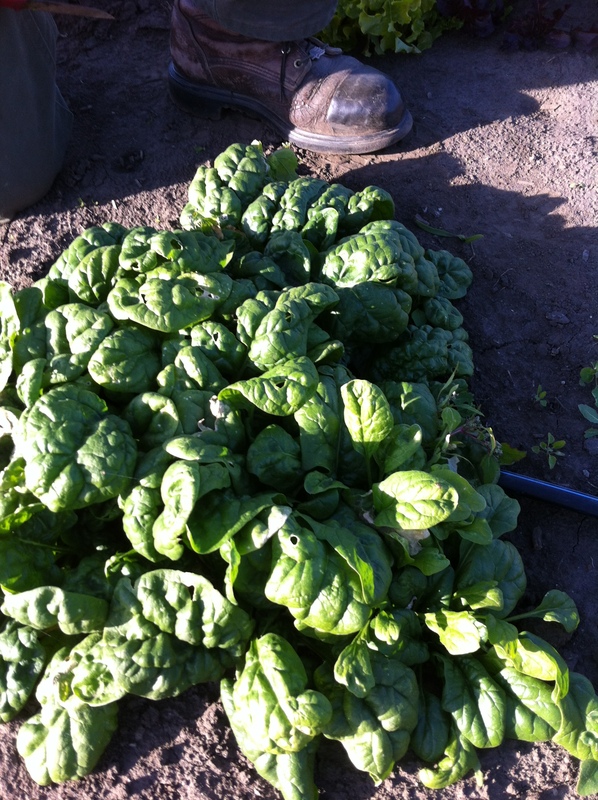 Our spinach is coming up nicely and we had a great first harvest of our third bed of salad greens and nice second harvest of our second bed. As I was harvesting the third bed of greens I couldn’t help but notice the silky texture they had to them. They were so delicate and beautiful. I couldn’t wait to serve them. 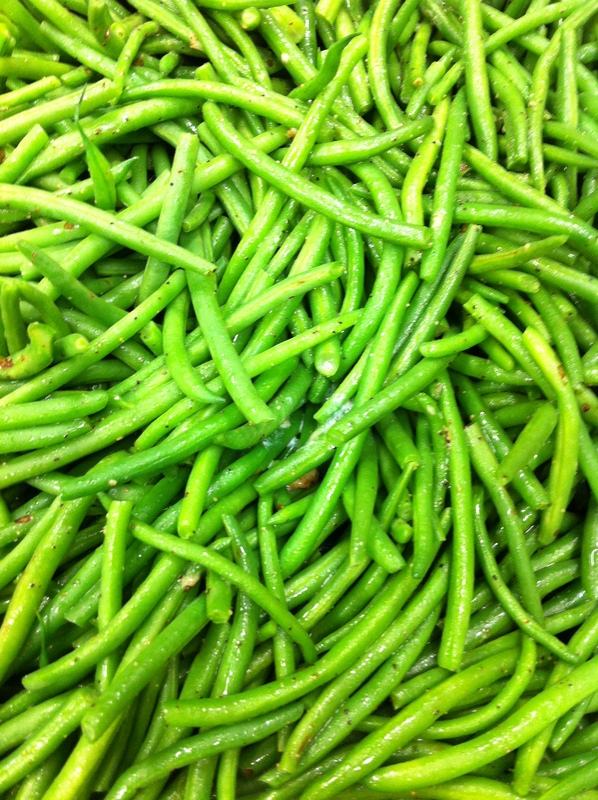 The green beans are coming in strong now and I hope to pull 40# this week. So far they are the running favorite of my boys.I am racing the days to still try and get a cover crop in by the 15th of October. If I can pull it off it will be very beneficial to next years growing season. Fingers crossed :-). Adios tomatoes!! We have had our ups and downs like any relationship but I loved you and enjoyed every delicious flavor you had to offer. I had to take a moment and sit in my tomato jungle before saying goodbye, although I was completely busted by my farmer friend Jeremy. 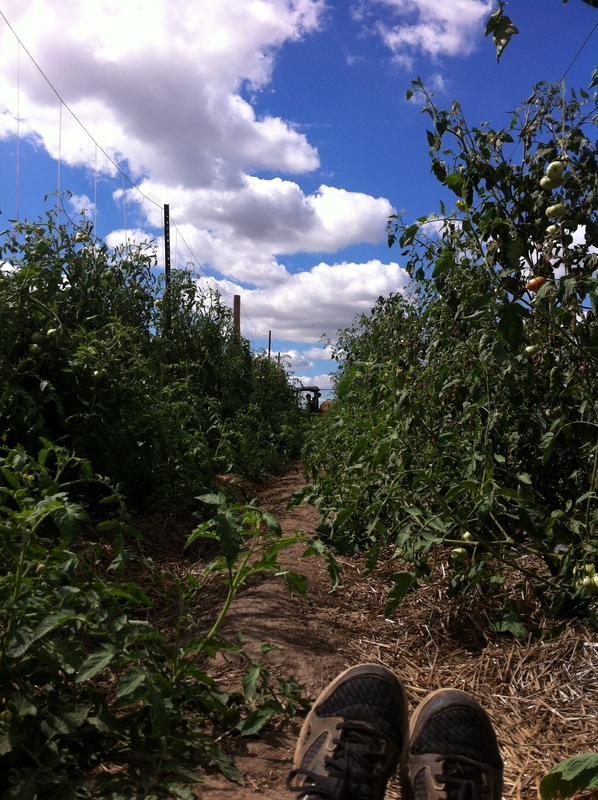 It was a little embarrassing actually because I laying in the middle of my plot enjoying the cool sunny day and trying to get one last picture of this season’s tomatoes when he pulled up. I am pretty sure he thought I was injured waiting for someone to drive by and find me. LOL. 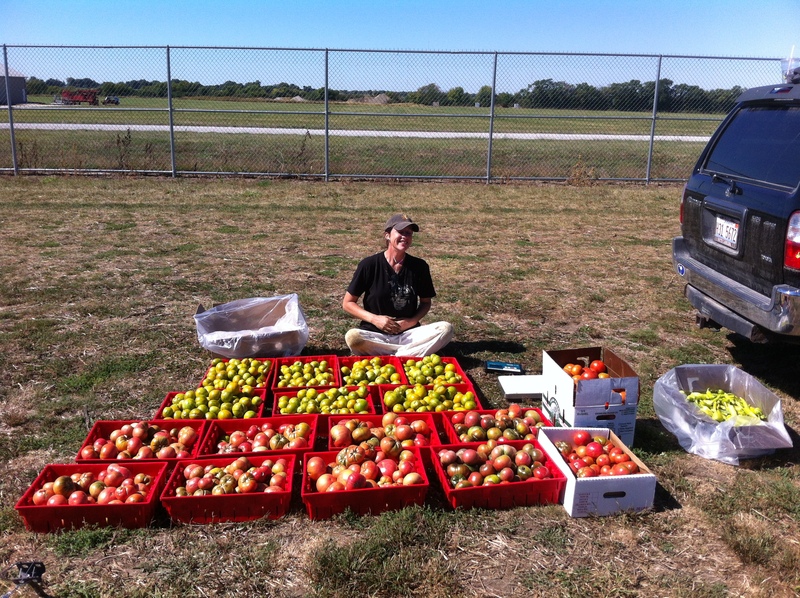 Kevin and I pulled another great harvest yesterday. In fact, it was one of the biggest days of the season. I mentioned that I cut the tops of the tomatoes, well they were all ready yesterday. 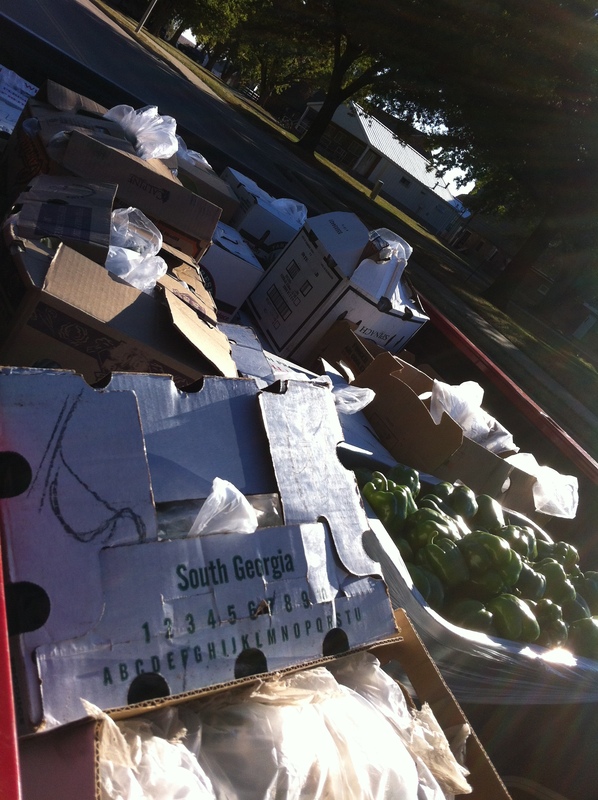 We also had a huge harvest of green bell peppers and green beans. We got a little over 700 lbs of produce off of our little plot of land in one day. I know that may not be a big deal to most farmers but I felt it was HUGE for us. It was hard to walk after I sat down for a bit last night. Kevin and I were like two little old people trying to shuffle around. It certainly was a great way to end one of the last big harvests of the season. We are not finished, by any means, but we will now be able to focus our efforts on to lettuce, spinach, a small amount of peppers, green beans and chard. 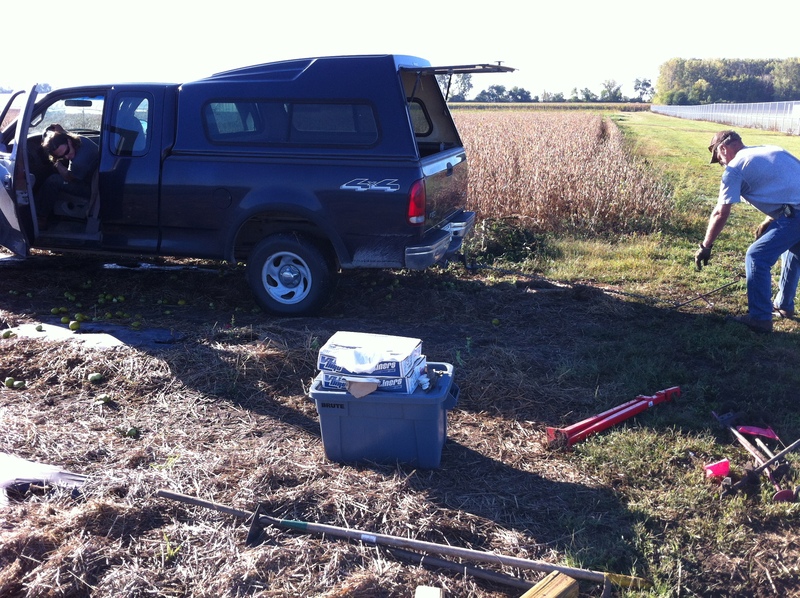 I am racing the clock to try and get things finalized to plant a cover crop by October 15. We still have a lot of things to do. 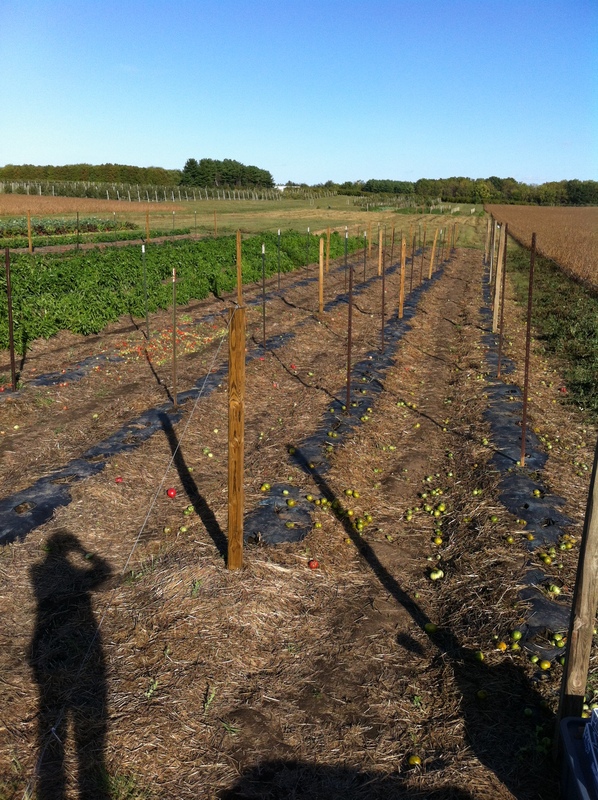 Now that the tomatoes are finished I will harvest as many green tomatoes that we have a place for and tear down the plants, removing the tomato clips and preparing the rows to remove the trellises. Once the trellises are removed then we will roll drip tape and pull plastic, preparing that side of the plot to be mowed and tilled. Never a dull moment and no rest for the weary!! It will be a little depressing seeing a bare spot where the tomato vines and trellising used to be. It will also be heartbreaking to uproot our pepper plants that have fought so hard and are now looking more beautiful than ever. Until next year!